11 WAYS TO A LIGHT & BRIGHT BASE. 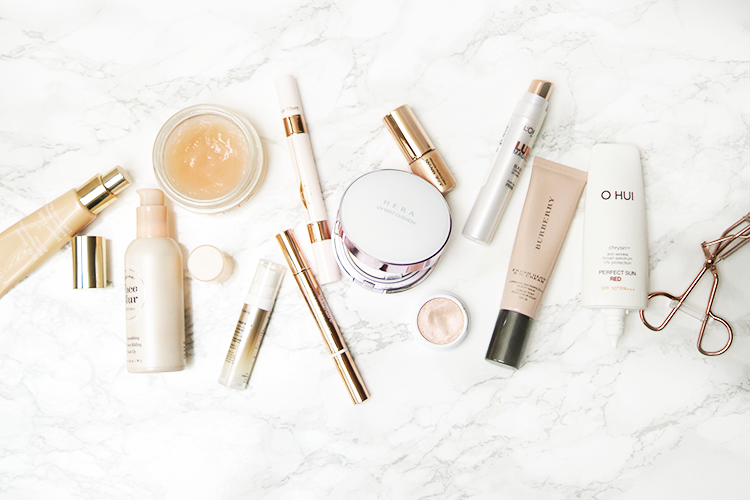 I get asked a lot what I use on my skin to get it looking radiant, bright and glowy. 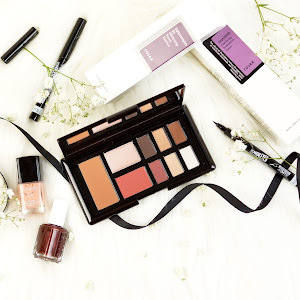 Whilst pretty much all of my beauty collection is targeted towards this aim, I wanted to share with you today a handful of skincare and makeup items that I've been using to enliven my complexion and achieve that light and bright look. 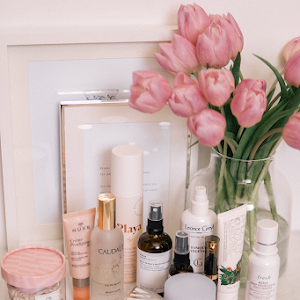 This is a whole thing in itself, and it's going to take a number of posts to explore it (you can start here with my Spring Skincare Picks For Dewy Skin) but I just wanted to touch upon a couple of pieces I'm using right now. Oskia Renaissance Mask £49.50 | I've been using this mask for month upon month now (I'm sure you'll have seen it featured in other posts) and still love it. Papaya, lemon and pineapple extracts, and lactic acid, loosen bonds in the upper layer of the skin to remove tired and worn out skin cells, and gently exfoliate leaving you with a bright, glowing complexion. The thick balm texture is a great one for me - I don't have to worry about any gloppiness falling off my face while I go about my daily tasks with this on. 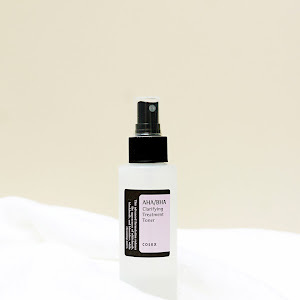 Bare Minerals Skinlongevity Serum £45 (here for the US) | A relatively new addition to my skincare arsenal, I've been trying this serum for a few weeks since I picked up some (very generous might I add) samples just before it launched. I don't know what kind of preconceptions I had about the range but I kinda thought - Bare Minerals, skincare, I'm not really buying into it.. I must say though that it's more promising than I envisaged. 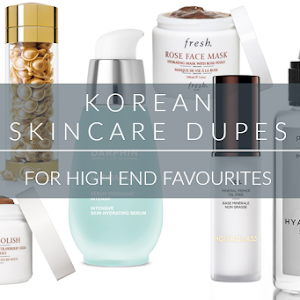 I'm not fully sold on the ingredients list as there are a lot of fillers bulking things out and I'd definitely say there's a Korean influence to the product as a whole (even the infographic on their site screams Kbeauty), but as well as peptides and saccharomyces (the same fermented stuff in SKII), niacinamide is near the top of the list, and we all know how much I love this skin-brightening wonder-ingredient. 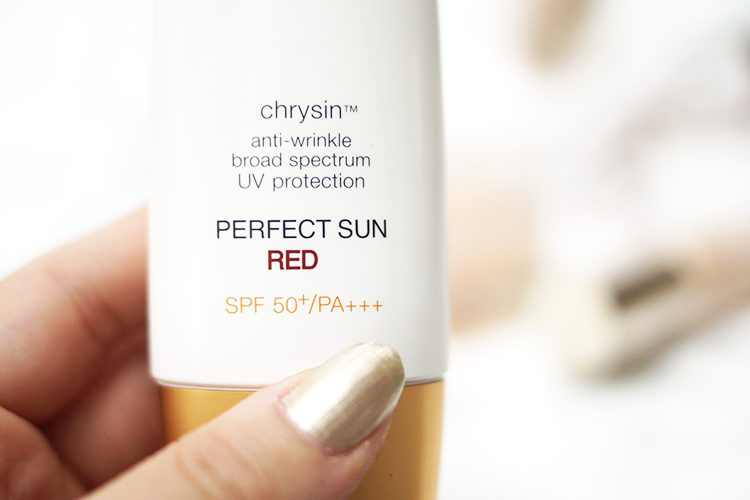 O Hui Perfect Sun Red £27 | This is my favourite sunscreen. I may well give it it's own review because there's a lot to say about it - so let me know if you'd like to see that! In short, this is a good, solid sunscreen, with SPF 50, a brightening, palest-pink hue, and anti aging formula including Vitamin B5 and licorice derivatives for brightening and strengthening the skin. 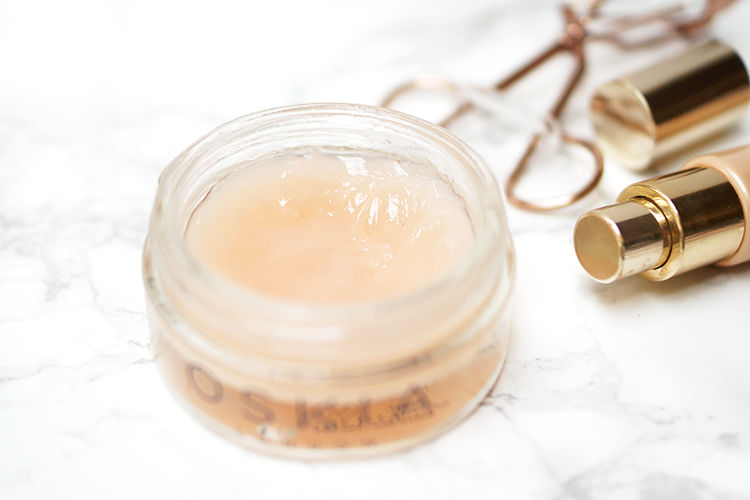 Whilst the formula is creamy, unlike some of the gel alternatives out there, it's not oily or heavy and is absolutely fine even when my skin is a little more oily through the summer months. 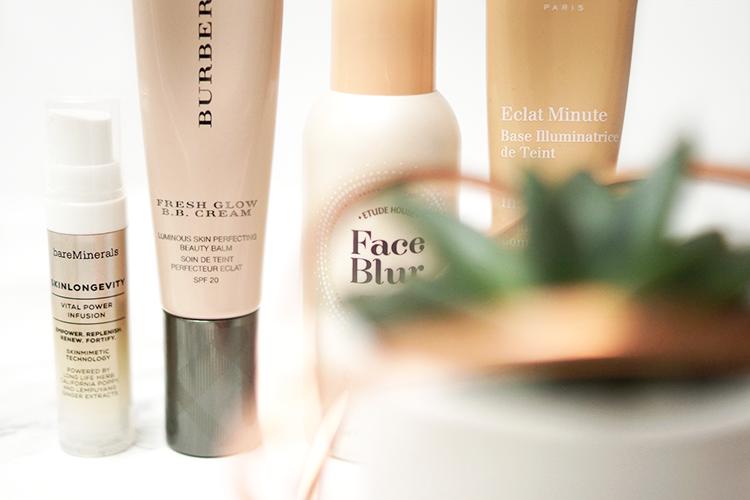 Etude House Face Blur £12 | A brightening primer and SPF in one (although I do wish this were SPF 50), this is one of my favourite Korean products. 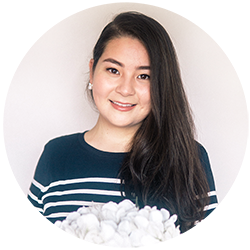 A pale and slightly peachy pink tone makes your skin look so bright and healthy, and as the name suggests, it blurs right over my pores, making my skin look perfected and more even without any makeup. Although I do sometimes wear this alone, it's especially good to wear under a cushion foundation for a little stick and a lot of brightness. L'Oreal Lumi Magique Primer £10 | Essentially a strobe cream, my first thoughts when this came out is that it'd be like a liquid highlighter and it would look like I'd smothered my face in glittery butter. It took me a long while to jump the bangwagon but I'm finally there and it was a good decision. The shimmer particles in this primer are teeny tiny and the white pearlescent cream smoothes and sheers out to a translucent nothingness, leaving you with a glowing complexion that doesn't look greasy. Whilst you can mix this into a base, I actually like to blend this 1:1 with my Face Blur and use all over under foundation. For a drugstore product, I'm thoroughly impressed. 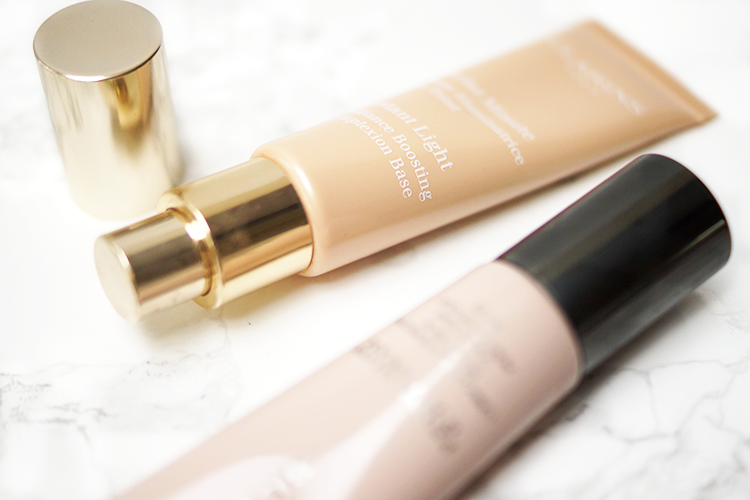 Clarins Instant Light Base £26.50 | Another old favourite, the tone of 02 Champagne makes my skin look a lot more lively and awake, just about cancelling out redness and illuminating any dull areas. For a no-makeup-makeup look I'd wear this alone, but otherwise top off with a cushion foundation. 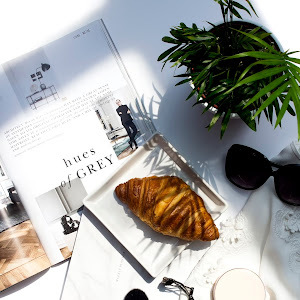 Hera UV Mist Cushion Foundation £37 | My favourite cushion for a dewy, bright look, there's something about the formulation of this that makes my skin look and feel extra plump and bouncy. Perfect for skins anywhere from dry to normal and eeking onto combo - I'd say oily skins give this one a miss. If you want to see this guy on my face, have a peep at the full review here. Burberry Fresh Glow BB £30 (here for the US) | This little guy has been hiding in a drawer and I've only recently just got it back out. In all honesty, this doesn't last well on my skin at all (although I'm currently testing it with a brand new primer that promises to glue makeup onto your face so I'll be updating you in due course!) and I think would be perfect for dry skins, but for the few hours I can get out of it, it looks so beautiful - super glowy, healthy, radiant and luminous. More is more after all. 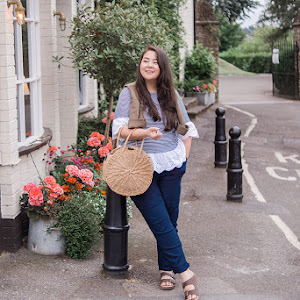 I'm leaving out highlighters - that's a whole other thing too, and you can have a look at my Top 7 Highlighters here - but thought I'd throw in a few extra products I really enjoy to rack up the brightness another notch. L'Oreal Lumi Magique Concealer £8.50 | Let's put it out there first that I think this is better than YSL Touche Eclat. It isn't as dry, it's easier to blend, it doesn't crease as much on my incredibly difficult and uncooperative undereyes and it's far cheaper. I like to go in on the outer corners of my eyes with this, as I get dark there for reasons unbeknownst to me, and sometimes down the centre of my nose. 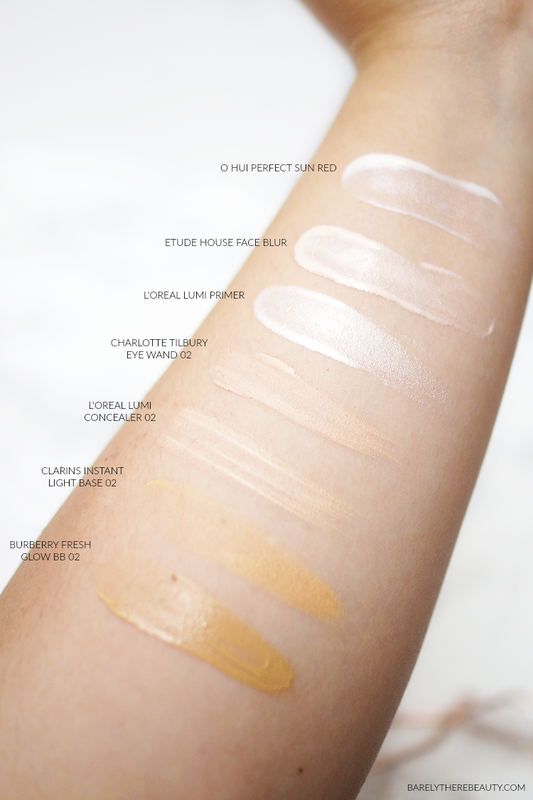 N.B - If for whatever reason, you're buying this blind, shade 02 Medium isn't the darker shade, it's just yellow toned whereas 01 Light is pink toned. 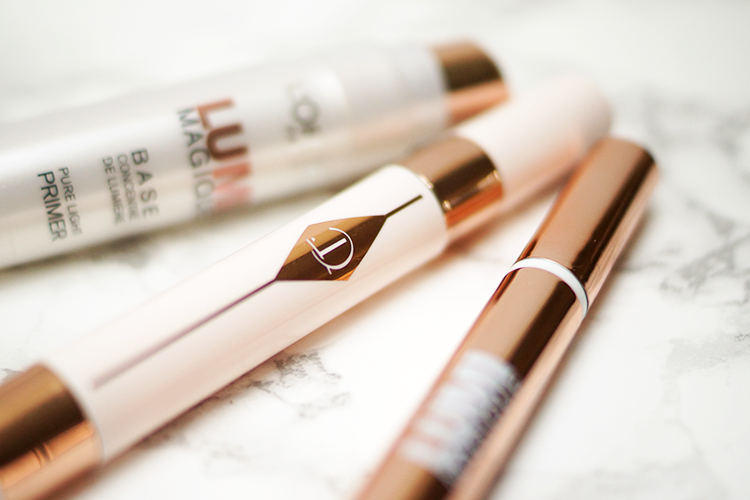 Charlotte Tilbury Mini Miracle Eye Wand £29 (here for the US) | As undereye, brightening concealing pens go, this isn't cheap. But I love a double ended stick product and actually, I've got positive things to say about this one - namely about the eye cream end. A really light, sheer, illuminating serum, it immediately brightens my under eye area, absorbing instantly with a little tapping - I love using it as my daytime eye cream (although I despise the whole notion of the 'Tilbury Tap', why is that any different to any other kind of tap to apply eye cream?). The concealer side is a brilliant colour - a soft peachy, pink, but I must say it doesn't blend quite as nicely as the L'Oreal Lumi. 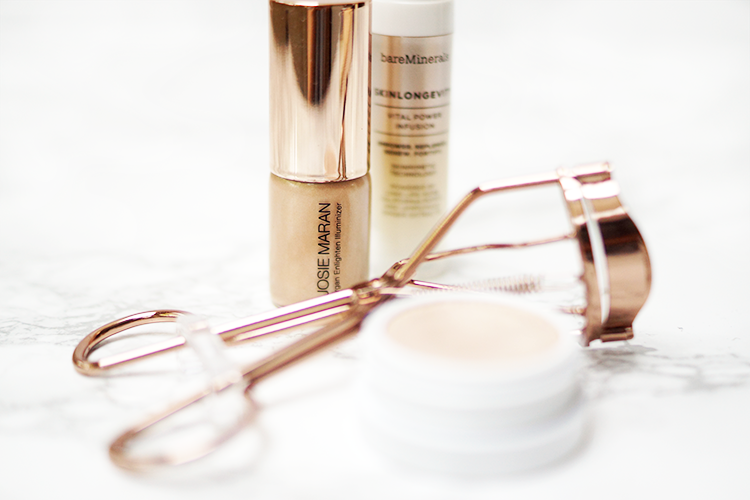 Josie Maran Argan Illuminizer £26 | I love the versatility of this illuminating fluid. Whilst yes, you can use it as a highlighter and tap along the cheekbones etc, I think it works really well mixing into a primer, or the Clarins Instant Light base for when my skin is a little more tanned. 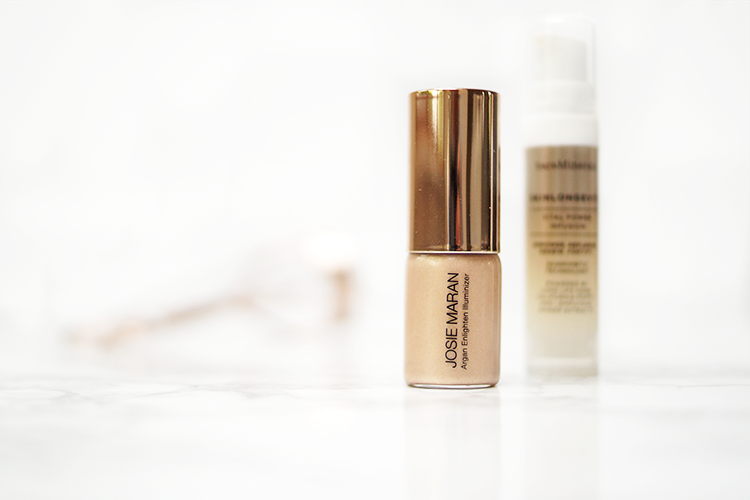 The argan-oil-infused formula blends so beautifully on the skin, imparting a glistening, smooth, golden finish. 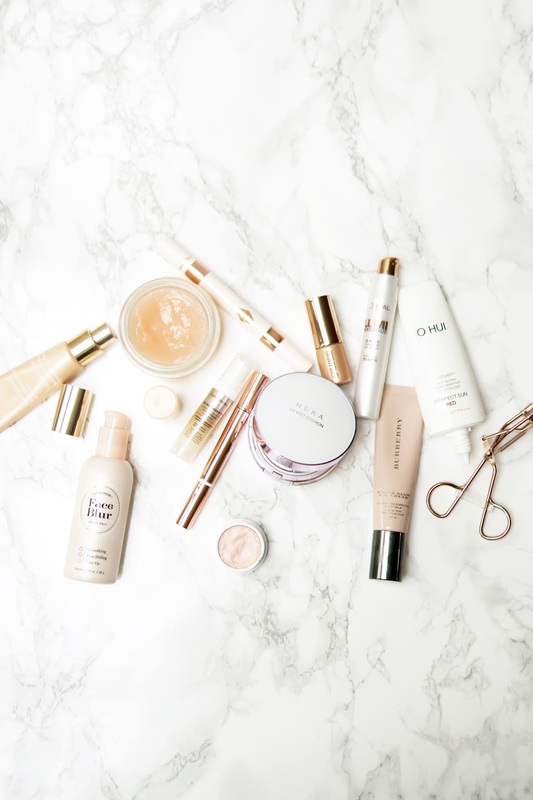 What are your fave products for a light and bright look? Let me know in the comments! P.S Have you seen Part 1 of my Kbeauty Haul? I really want to try the Oskia Skin mask, I've heard some amazing things about it. O man, can I try all of these!? You make them all sound so good! If I had to pick just one, what do you suggest I start with? I'm a bit of a novice with skincare and have been sticking to dermalogica products. Glowy and radiant skin comes with a good skincare routine, without it makeup doesn't look flawless at all. Oskia mask sounds good, it is one of the brands I want to try out. That sunscreen is really, really interesting. Yes, please do a full review. The products themselves already look so glowy, like the packaging is so pretty! I need to start using some of those! These photos are uhhhhhhmazing. They are genuinely incredible. 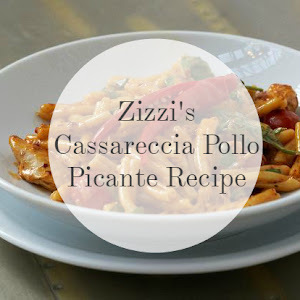 Pinterest perfect! Bravo. 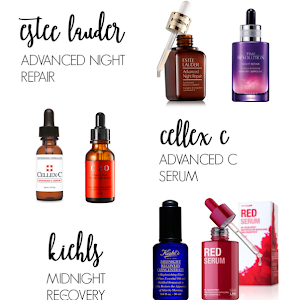 I also love the look of ALL of these products, especially that CT one! 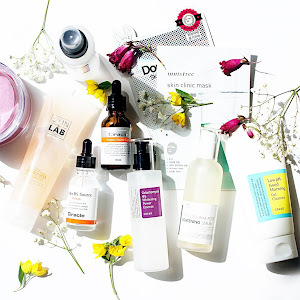 I really am the worst when it comes to skin care, I truly hope I'll follow some of your advice, it was a really powerful post. 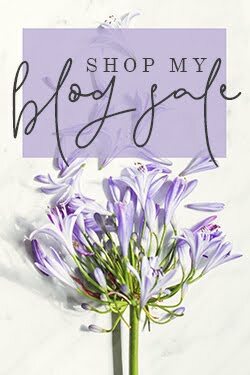 I also want to congratulate you on the aesthetics of your blog, it's a pleasure to read your posts when you have such a cool web design! 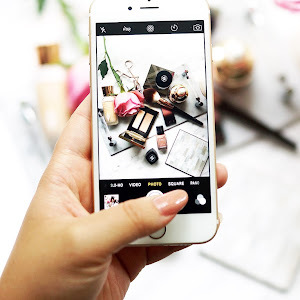 This is such a great roundup of products, most of which I haven't heard of until now! I've been hearing so much buzz around Korean beauty products lately, so I'm interesting in checking out the Etude House primer! Thanks so much for sharing and I hope you're having the most amazing day so far, beauty!